Good morning, everyone! 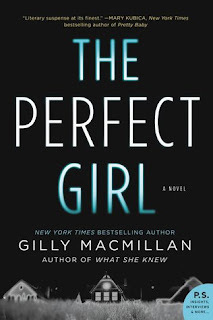 Today I'm a stop on the TLC blog tour for Gilly Macmillan's latest, The Perfect Girl. Zoe seems to have it all - a perfect family and a promising future as a musician -, but appearances can be deceiving. Just a few months ago, Zoe finished serving out a sentence for manslaughter after killing three people in a car accident while driving drunk. And now, on the night of her emergence back into society, a concert meant to help her ease back into the music world, her own mother has been killed. I quite liked The Perfect Girl! Macmillan plays with the timeline in a way that builds the suspense steadily while drawing out the story. We meet Zoe, her aunt Tessa, and her solicitor Sam as narrators throughout. And through them we meet Zoe's mother, her stepbrother, and her stepfather. Their home life sends up big blaring warning signals to the reader pretty immediately - the stepfamily, for example, have no knowledge at all of Zoe's crime! And they've got their own secrets, apparently, as we learn pretty early on that Zoe's stepbrother has something he feels is very important to share with his new mom and sister. Something he won't vocalize but instead puts in an email as a screenplay he hopes they'll both read. Zoe begins our tale on the night of the concert. Yes, she's a pretty well known name but the family has moved and, given there are now new additions to said family, Zoe has a new name to boot. So when the father of one of her victims shows up, it's a pretty big surprise. And then we cut to the following morning and Sam, Zoe's solicitor from when she went to court at fourteen. Sam has received a phone call from his secretary stating that Zoe is waiting for him in his office - her mother has been found dead. The story bounces around from there - the concert, the night after the concert, and Sam on Monday morning - but much of the Monday morning chapters serve to set the stage for the crime that occurred three years ago, giving the reader a chance to see Zoe's full story unfold. As the two timelines begin to converge, it becomes very clear that things even that far back in Zoe's timeline are not as cut and dry as they may have seemed. I've been on a streak of great, quick reads this week and while The Perfect Girl did have a bit of a slower pace, it was definitely one I enjoyed immensely. For more on Gilly Macmillan and her work you can visit her website here. You can also like her on Facebook and follow her on Twitter. I liked this one pretty well, but I think I was more fond of the previous book - What She Knew. Had a bit of hard time connecting with the characters here. Perhaps I should read it again at some point. It's well worth the time though!